We, UKM HIMPUS - student representation of Veterinary Faculty of Syiah Kuala University, will carry out our second organized event to spread the word about WMBD. In 2015, UKM HIMPUS participated in a WMBD event organized by Aceh Birder. In 2016 - 2017 UKM HIMPUS continued WMBD celebrations as an organizer. So, this year we would like to continue our engagement in WMBD celebrations. The distribution of sticker about bird’s migration to residents around Syiah Kuala University on 30th April 2018. Media event: video competition about bird’s migration on May 1st 2018. Participation is open for everyone. Migratory birds picture coloring contest for kindergarten children on 4th of May 2018 at the Veterinary Faculty Of University Syiah Kuala. Observation and Birdwatching of Bird Migration on 13th of May 2018 at the Province of Aceh in Ulee Lheue, Banda Aceh, Indonesia. Beachside cleaning in Ujung Pancu Peukan Bada by all members of UKM HIMPUS and seminar participants after birdwatching. The target participants are the students of University Syiah Kuala, the students of Universities in Aceh, the student of elementary, and high schools in Aceh and the Public. We expect a total of 350 people, more or less. 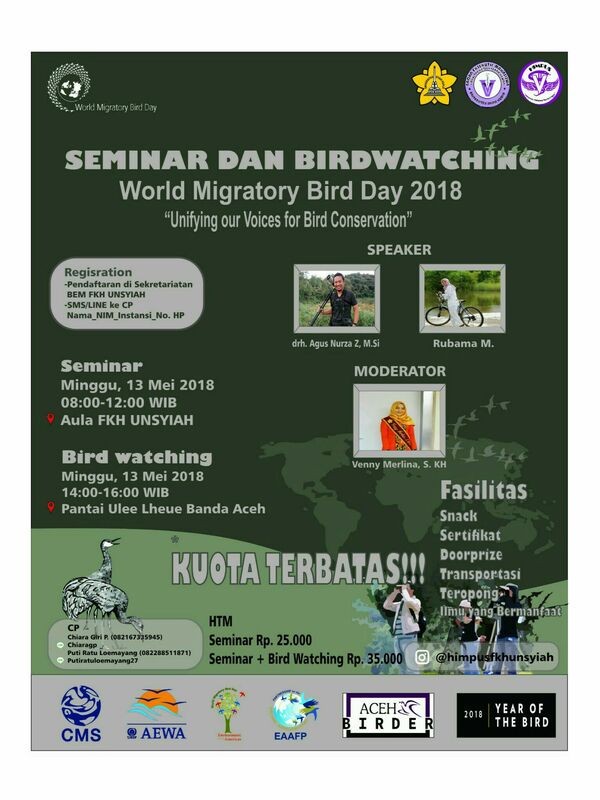 We hope this activities will provide early education for the children, increasing the awareness of Aceh’s citizens regarding migratory birds, and living in a healthy environments for the migratory birds and humans. In doing so we also hope that it will trigger more activiies for nature preservation especially to preserve the life of birds.